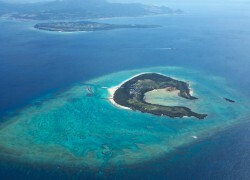 A 15-minute ferry ride from Motobu Port, the 4.5-kilometer-long Minna Island has a croissant shape from the air. The water of Minna Island is known for its clarity, and its beautiful beaches are pure white sand. Reefs are located offshore, so you can thoroughly enjoy an expanse of white sand and transparent water.